A large group of classic car devotees hit the road and headed south either by plane, car, or truck and car-carrier trailer. On the Tuesday before the weekend show, a caravan of two trucks with car trailers left the area bound for Amelia. In an enclosed trailer, was the soon-to-be-revealed, 1960 Triumph Italia 2000 Vignale #122, recently restored by Ragtops and Roadsters & Pollock Auto Restoration. This rare car was invited to be on the show field for the Sunday Concours. 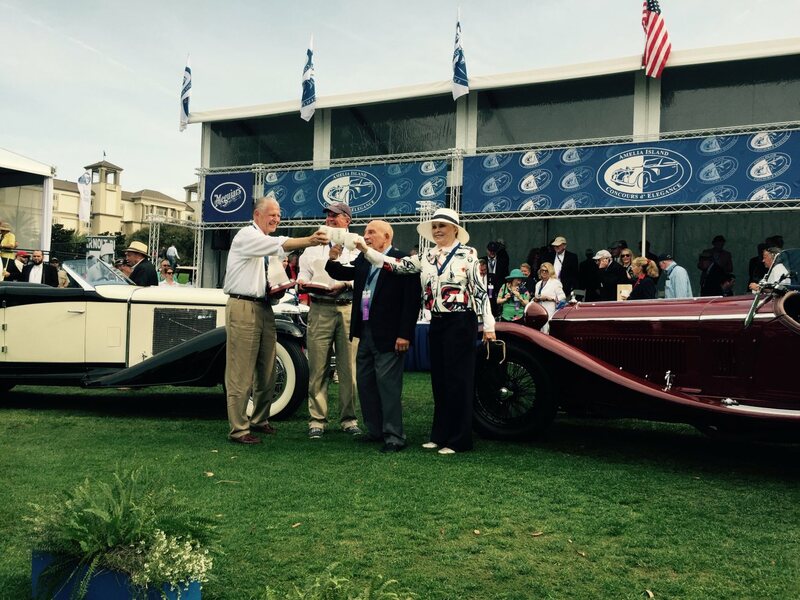 Driver, Bill Murphy, with co-pilot Sumra Manning, transported another invited car, the only surviving example of a 1922 Secqueville-Hoyau for it’s owner, Alex Giacobetti who is a Delaware Valley Jaguar Club member. Bob, my co-author, "paid his dues" last year with a round-trip drive to the show, he opted to relax and fly down to meet my colleagues this year. 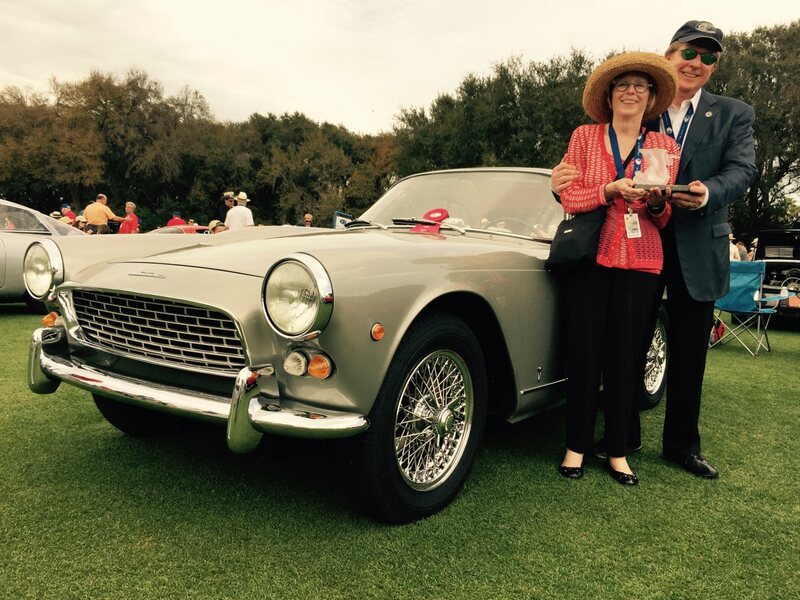 We all eventually converged on Sunday, March 15th, on the 18th green of "The Golf Club of Amelia Island" for the world-famous 20th Annual Concours d'Elegance, a proverbial "bucket list" event for many of the attendees. Attending were Alan and Robin Anspaugh, Alex and Terri Giacobetti, Brad and Susan Danish, Mike and Peggy Engard. Dave and Charlene Hutchison, Sumra Manning, Bill Murphy, and Bob DeLucia. Several of us arrived on the Wednesday evening before, for a Thursday morning specially guided-tour that we set-up with Andy Reid of ClassicCars.com, of the upcoming R&M/Sotheby’s auction that would take place at Amelia. The nearly three-hour tour was wonderful, with great details on the exquisite cars that would be up for auction. 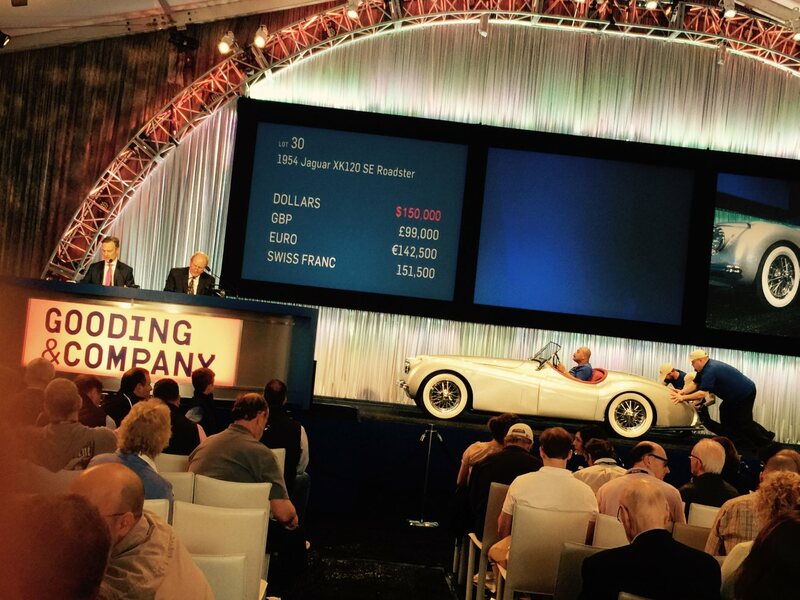 One car owner was particularly interested in a Sunbeam Tiger being auctioned. 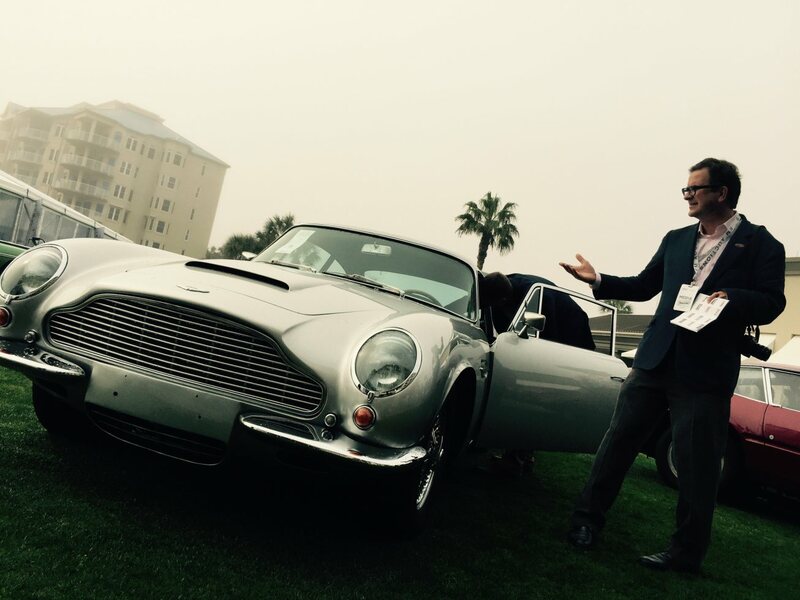 The auction eventually resulted in $60,360,050 in total sales and a 98 percent sell-through rate. Following the tour, we explored the grounds of the Ritz-Carlton where the hub-bub of 24/7 auto activity was starting to transpire. As we went to lunch, we happened upon this year's Honoree, Sir Stirling Moss, quietly sitting with just two people. Circumstances prevailed and an autograph and photo were obtained. Dinner was at a wonderful seafood place in the lovely little town of Fernandina Beach. Being a huge car weekend, all the talk was of the cars coming into town. We later attended two seminars at the Ritz-Carlton. 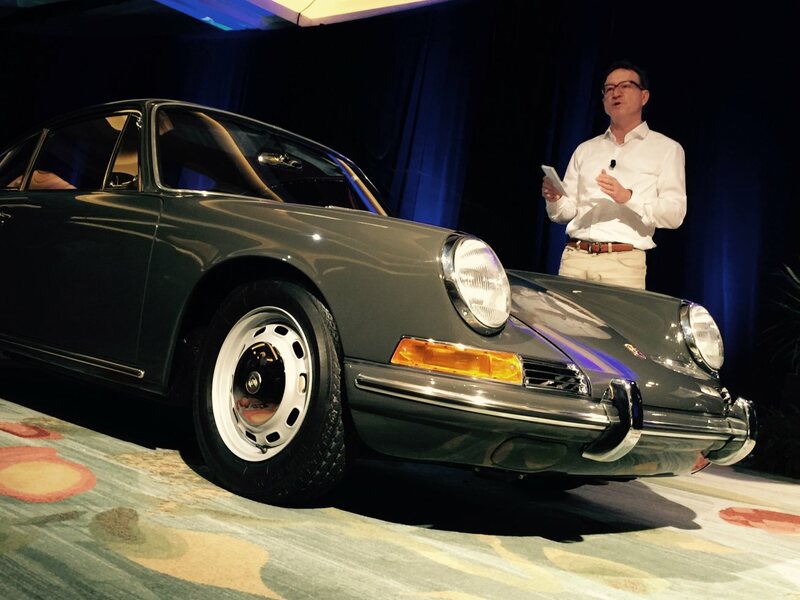 The first on Friday afternoon was "Design DNA of Iconic Cars", maintaining the brand appearance featuring the Mercedes Head of Design, the Porsche Head of Design, and Ed Welburn, Head of Design at General Motors (the man who made the call on the square tight lights on the new Corvette). All had multi-media presentations to accompany their talk and later offered a Q&A. Overall this was a very good and informative session. 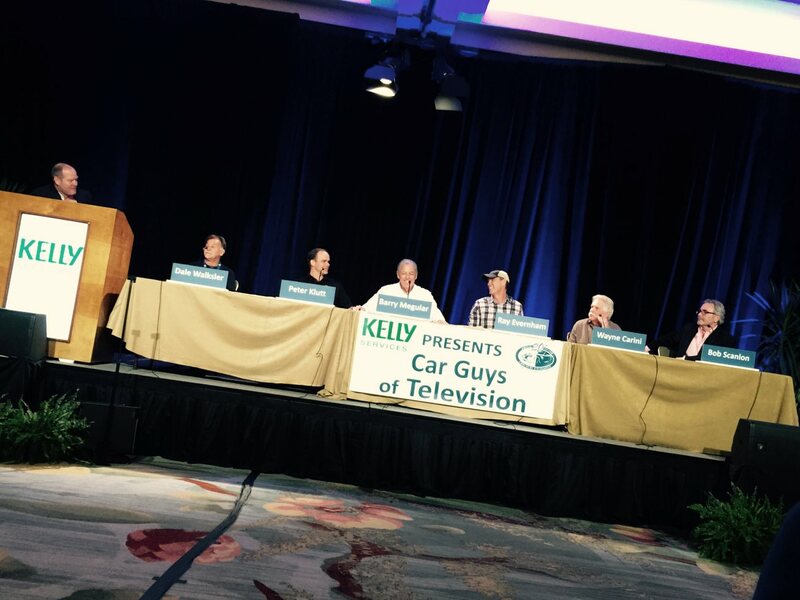 Less formal, but just as informative, as would be expected, was the second seminar on Saturday morning, "Cars Guys of Television". The panel had many familiar faces, including Wayne Carini, Ray Evernham, Peter Klutt, Barry Meguiar, Bob Scanlon, and Dale Walksler. 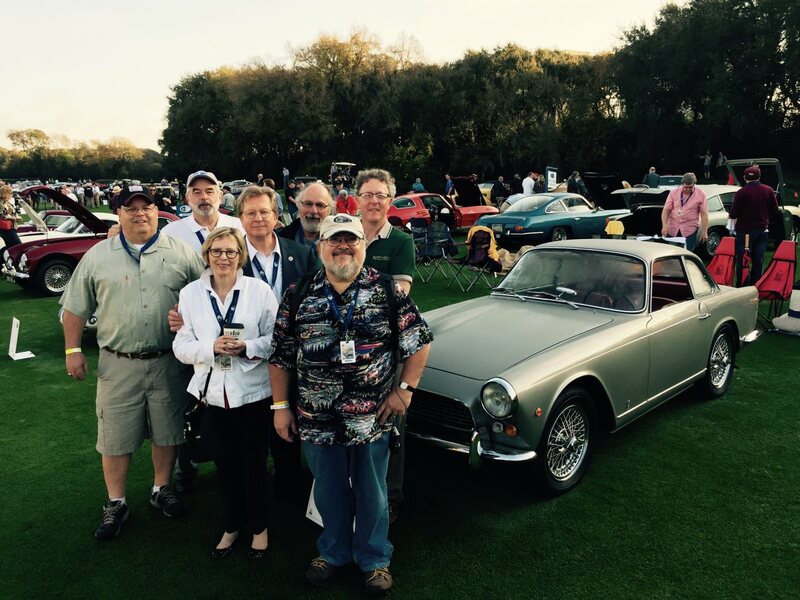 Saturday morning was "Cars and Coffee" on the 18th hole of the Concours Field. Pre-registration was required and the field had about 300 cars. 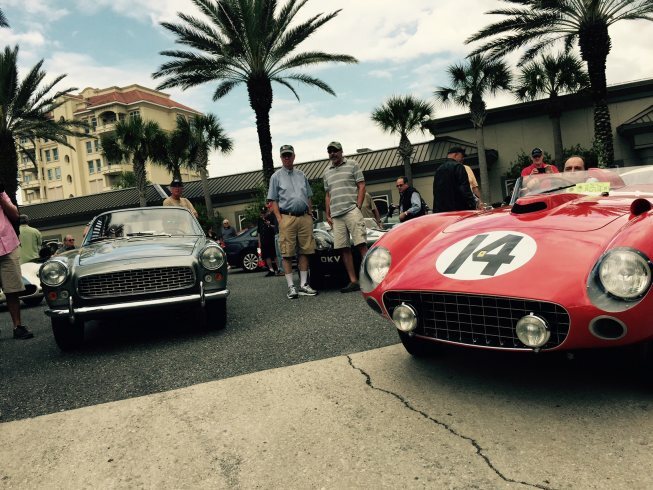 There were both concours and some not-so-concours quality cars to look over. 1:00pm arrived and it was great to watch them start-up and leave the field. Following that, the decision was made to take the show cars we brought to the field for the next morning's show. We went to the transporter staging lot to take the Triumph Italia 2000 and Secqueville-Hoyau out of their trailers. Both cars were driven the five miles to the show field, to register and be parked on the field in their category, and covered for the evening. The 1960 Italia was parked in the Class SC3 (Sports and GT Cars (1960-1964) and the 1922 Secqueville Hoyua was placed in the ECC Class for nickel era cars. 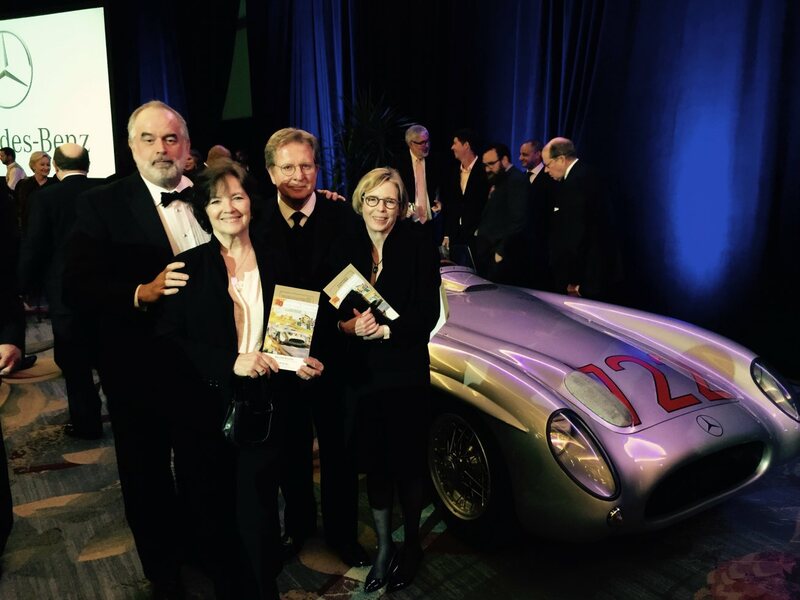 Saturday night Charlene and I had had the pleasure to attend the gala reception presented by Mercedes Benz at the Ritz Carlton with Alex, Terri, Al and Robin. 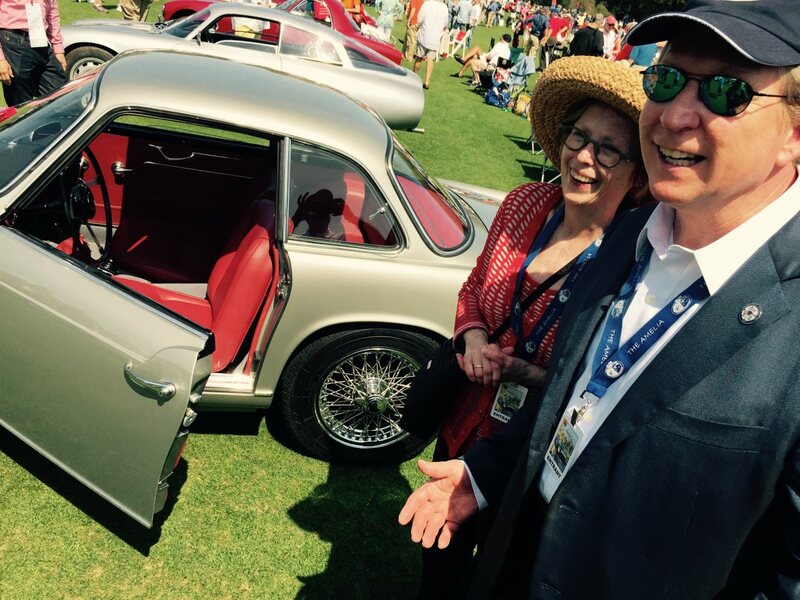 A wonderful video was produced thanking Bill Warner, his family and army of supporters for the dedication to host a world premier classic car event for the past 20 years! Mr. Warner was very touched as he had no idea this was produced. He was then visibly moved as he spoke about the loss of a his dear friend and great car guy / actor Ed Herrmann. It was Ed who introduced me (Dave) to Bill Warner at Fall Hershey in 2002. Ed and Bill always walked he field and he will be missed! Next a tribute was paid to this year's honoree, Sir Sirling Moss. Again, Bill’s narrative accompanied a video of Sir Stirling's racing accomplishments. The presentation was very well crafted. 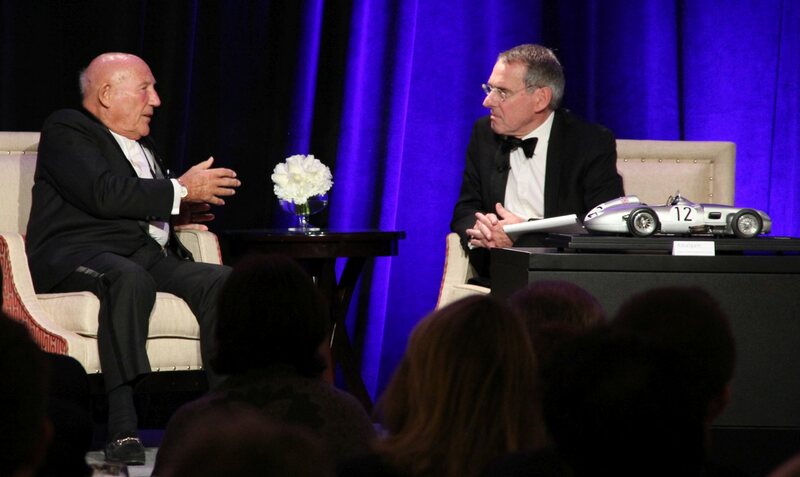 After a standing ovation, Sir Stirling sat in a over stuffed leather chair in a living room setting for a Q&A session. Charming as always, he was very thankful for his career and never expected to be here today. When asked what was his favorite car to race, without hesitation he pointed to the famed “722” that was in the banquet hall. He mentioned that he was very thankful that the handling was so precise as he was at full race speeds right next to spectators leaning out to get a look. His lap record still stands today and always will. Sunday was show time and an early departure for us so we could make our way to do a final detail and inspection of the cars, and to watch the other 50% of the show cars arrive on the field before the 9:30am opening when the field flooded with 32,000 spectators! The last car to enter the field was the winning car from the 1955 Mille Miglia, the famed “#722”, a Mercedes-Benz 300 SLR, driven then, and now, by Sir Stirling Moss. I am sure that Bill Warner enjoyed that ride! Every other word from our group was a “Wow!”, "What a beautiful car!”, “I've never seen one of them!” or just a huge grin. Cameras were clicking furiously. Video was rolling. The entire show field was overwhelming to the senses. "Eye-candy" everywhere. It took great self-discipline and focus to go down one aisle at a time, without turning around and looking at what was about to be seen. 315 vehicles, in over 30 categories of world-class, by-invitation-only, classic cars, racing cars, and even motorcycles. One of the many highlights was a display of the "Cars of Stirling Moss", with 20 cars he raced over his ten year career from 1951 – 1962. The afternoon awards were highlighted for us as Al and Robin’s 1960 Triumph Italia 2000 GT won an Amelia Award, resulting in the opportunity to drive their car up to the reviewing stand to accept the award. Quite an honor for the car's first show! The Best of Show for the Concours d’Elegance went to the flawless 1930 Cord L29 Brooks Stevens Speedster and the Best of Show Concours d’Sport went to a stunning 1932 Alfa Romeo 8C 2300. It was definitely one for the record books and I ask myself every year I attend (nine and counting) how can this show keep getting better? Well it does EVERY YEAR! Here's a short of 722 coming on to the show field - Enjoy!